Jack tells Doug he had no idea about Gaby being pregnant; he hasn't seen her for months. Gaby tells Pam it's too early to be thinking about antenatal classes and booking a hospital bed. Pam tells her she will be there to help her. Annalise is excited to overhear that Gaby is pregnant. She admires her for having the baby on her own; she thinks it takes real guts. Michael is reading up on the medals he found and thinks they could be worth a lot of money. Helen suggests he get them valued. Debbie is annoyed that Michael isn't pulling his weight on the papermaking project. Gaby is still surprised about Annalise's reaction; it was 100% better than Pam's. Pam admits Gaby is right and apologises. The menopause is no excuse; she behaved really badly and she's ashamed of herself. Jack isn't sure what to do. Gaby obviously doesn't want anything to do with him. He wonders if he should try to talk to her; he has a right, doesn't he? Pam tells Gaby that single parents are almost the norm these days; everything will work out alright. Gaby is horrified when Doug arrives home with Jack. Pam wants to know why Gaby hadn't told him. She suggests Jack leave and Jack says he'll be in touch. Gaby yells at Doug; how could he? Michael is showing the medals to an expert (Ron) who is suspicious about where they came from. Michael has read that the Distinguished Flying Cross could be worth a couple of thousand but Ron tells him he could be disappointed. He'll have to check on it. Doug tells Pam he only did what he thought was best but Pam tells him Gaby didn't want Jack to know. Doug thinks Jack should contribute towards the child's future. PAM: I don't know, Doug. I think we just see things differently sometimes. Michael gets an offer from Ron on the phone but tells him he'll have to think about it. The DFC is worth $2,000, and that's just one of the medals. He tells Debbie he's in no hurry for the money, and the value will keep increasing. TOM: Does that look like an orange to you? TOM: I thought so. It's supposed to be a sunset! Pam daydreams about relaxing on a hot tropical beach and Helen wonders if she's missed something. Pam and Tom exchange a look like naughty schoolchildren. Doug apologises to Gaby. Gaby admits she should have told the truth. She still refuses to have Jack involved. She may need money from him in the future but not now. She's not ready to talk to him yet. The class is ending and Tom invites Pam for a coffee again. 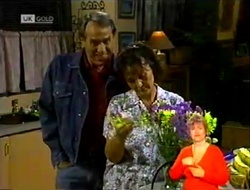 However, Doug arrives with flowers as a peace offering and Pam leaves with him. 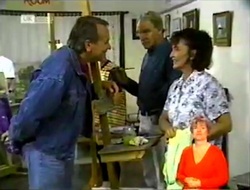 Tom tells Helen he assumes that was Mr. Willis. A man is peering through the windows of the house and asks Michael if he knows what happened to the lady who used to live here. Michael tells him she died and Doug bought the house to renovate it. The man says he used to live here and asks if they have found the bomb shelter he built yet. All the stuff in there is his and he wants his medals back. MICHAEL: Oh, I get it. You wouldn't happen to know a guy called Ron Barrett would you? MAN: Yes, he's a mate of mine. He recognized my DFC. Michael wants more proof but the man tells him to get the medals and meet him here this afternoon. Doug asks Pam if she's feeling better. Pam says it just takes a bit of getting used to; she's going to be a granny. 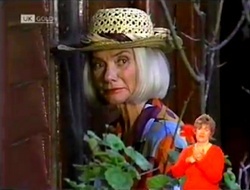 DOUG: You'll be the most glamourous granny in Erinsborough. They'll think you're the kid's mother! Doug thinks Pam will love it and Pam realises how excited he is about the baby. Doug starts tickling Pam and chases her to the bedroom. 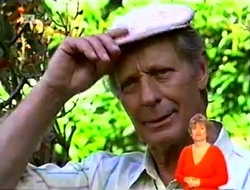 Michael is telling Helen about the man and insists he was trying it on. He could have found out about the bomb shelter from a neighbour, and the man who used to live there was supposed to have drowned. HELEN: How old is he? MICHAEL: Oh you know, pretty old. HELEN: Meaning that he must be at least over 25. MICAHEL: Oh no, he's much older than that. More your age! Michael says the house was owned by Mary Pengelly and the name rings a bell with Helen. 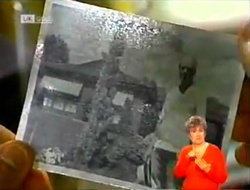 She asks Michael to fetch the photos he found. Gaby orders a coffee and thanks Annalise for being so supportive yesterday. She tells her the coffee shop has really picked up since Annalise took over as well. Annalise asks if Lassiters would sponsor her in Miss Erinsborough but Gaby refuses to let the hotel get involved with something so sleazy and sexist. 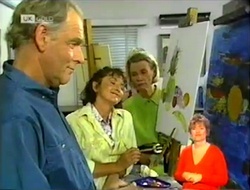 Helen and Michael look at a photo taken in Ramsay Street ten years ago and Helen asks Michael if it is the same man. Michael says it could be and asks if he used to live in the street. Helen says yes. Debbie comes in and has another go at Michael over the paper making. She kicks the case Michael found at the house and Michael picks it up. 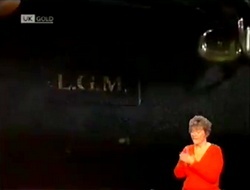 Helen notices the initials LGM on it. HELEN: Michael, that man at the Pengelly house… when did you say you're going to see him again? 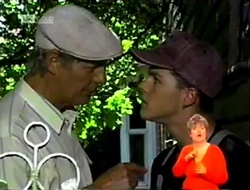 Jack arrives to talk to Gaby but Gaby doesn't want anything from him and tells him to leave. Jack yells at her to listen to him. He doesn't want to be involved so she doesn't have to worry; he will stay out of her life. However, he insists on contributing to the upbringing. He says that's it and leaves. Helen and Michael arrive and the man asks Michael where the medals are but then spots Helen.